Friends 4 - Snoopy And The Gang! 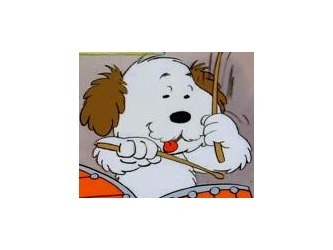 Spike is probably the most well-known in Snoopy's family, as he is seen the most in the strip. 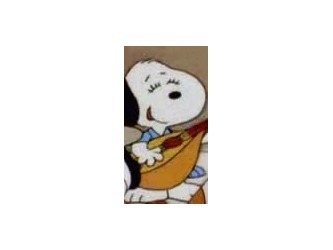 He is, in fact, Snoopy's older brother. He has made visits to Snoopy, and written him numerous letters. 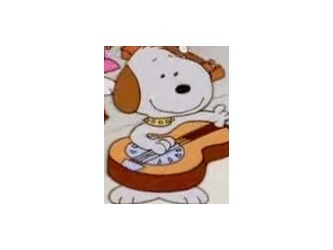 His most well known appearance is in the special Snoopy's Getting Married, Charlie Brown. He also appeared in I Want A Dog For Christmas, Charlie Brown, because Rerun wanted a dog, and Spike made the trip to visit. He lives alone in the desert in Needles, California. In the strip, his skinny weight is explained by the fact that he lived with coyotes, and was given the task of cleaning their den. Below is a strip from when Spike gained weight during a visit with Snoopy. Olaf is Snoopy's well-rounded brother. He lives with his brother Andy on a farm. He wears a hunting cap and plays the jug. Andy plays the drums, but is clumsy about carrying them around on trips. Olaf often writes to his mother on Mother's Day, thanking her for raising him. He was first seen in the strip in 1989, when he visited Snoopy. Andy appeared in 1994. On one occasion, they tried to find Spike in Needles to live with him, but ended up finding Snoopy. After a brief stay, and failed attempts to become other kids' dogs, they wandered around for awhile, then headed home. They never found Spike, unfortunately. Andy and Olaf appeared from time to time after that, still living on the farm. Belle is Snoopy's sister. She lives in Missouri. She only made a few appearances in the strip, and is more widely known for the stuffed toys sold with her resemblance from the 70s and 80s. She made her first appearance in the strip in 1976, and she is mentioned in the opening credits of The Charlie Brown And Snoopy Show. Her main TV appearance was in Snoopy's Reunion. She plays the violin, like Spike does. Some readers of the strip mistook her for Snoopy's girlfriend. She married, her husband left her, and she was left with a teenage son resembling the Pink Panther. Marbles is supposedly the smartest of Snoopy's siblings. He was seen in the comic strip for a story in 1982, wearing shoes. His only TV appearances were in Snoopy's Reunion, and during a flashback sequence in I Want A Dog For Christmas, Charlie Brown. I don't think Molly And Rover were ever actually given names by Schulz. They only appeared in Snoopy's Reunion, and they were never in the strip as featured characters. Andy lives with Olaf, as mentioned in his bio.